Housing loan with fixed interest rate for the first 5 years. Transfer of the salary in Sparkasse Bank Makedonija! Persons who do not receive their salary in Sparkasse Bank Makedonija, and are willing to apply for this product, must file a statement that their salary will be transferred through the Bank within 45 as of the date of conclusion of the Loan Agreement. 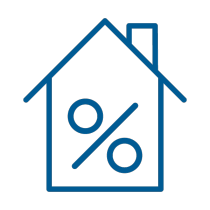 Please use the calculator to obtain information estimate of the monthly installment for a housing loan with fixed interest rate for the first 5 years.